This is one of my favorite “go to” salads in the summer months when tomatoes are abundant and taste the best. So on a hot summer day like today, we made this tomato cucumber salad as our main course. We also like to make this salad as a side dish when we are barbecuing chicken or steak. When preparing the salad ahead of time, chop and mix the veggies in a bowl and store in the fridge until your are ready to serve. 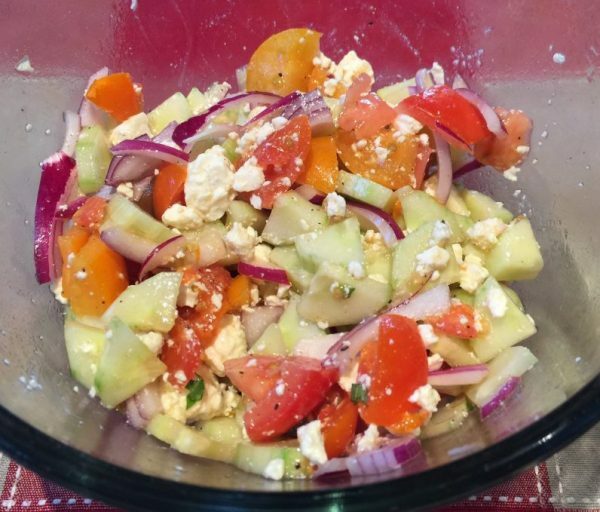 Add the salad dressing and crumbled feta cheese right before serving to avoid a soggy salad. 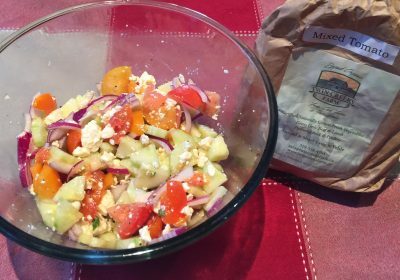 This salad is quick and easy to make using succulent tomatoes and cucumbers grown locally on the Bruce Peninsula. It doesn’t matter where you live, try and support your local farmers and growers by eating seasonal fruit and vegetables. You can find most of the ingredients for this salad at Eat Local Grey Bruce. Fresh local produce makes this salad a go to dish for our family during the summer months when tomatoes and cucumbers are at their peak freshness and flavour. Toss all ingredients in a medium sized salad bowl and serve immediately. To increase the serving size just add an extra tomato or cucumber. Be creative and use your favorite flavored balsamic or wine vinegar. For this recipe I used Cara Cara Balsamic Vinegar from the South Hampton Olive Oil Company.